for iOS11, Voicepaper 2 will be released soon for Lisgo users since Lisgo won't work on iOS11. Voicepaper 2 supports Pocket, Dropbox, Evernote and Copy and Paste to import texts and web pages. Please submit your email here to get notified when it's available. 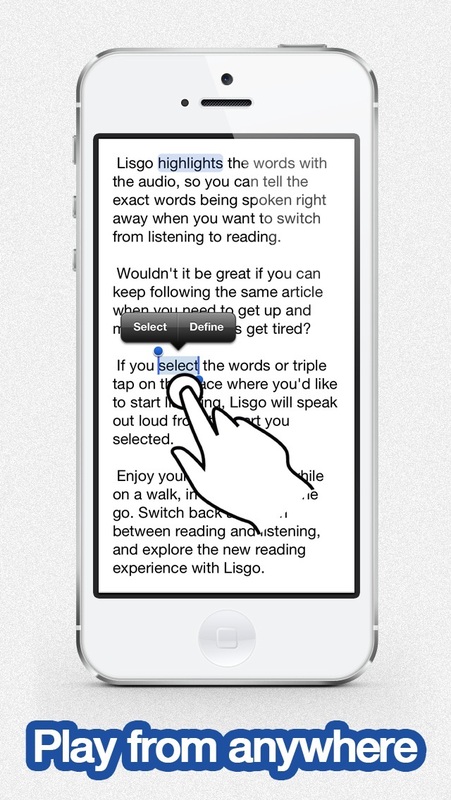 bit.ly/voicepaper2 Lisgo reads web articles saved in Pocket aloud to you with a natural-sounding voice. With Lisgo, You can enjoy interesting articles while you're cooking, exercising, or commuting. ◆Supported language voices? English, Japanese, German, Spanish, French, Chinese, Portuguese, Russian, Arabic, Italian. ◆What is Pocket? 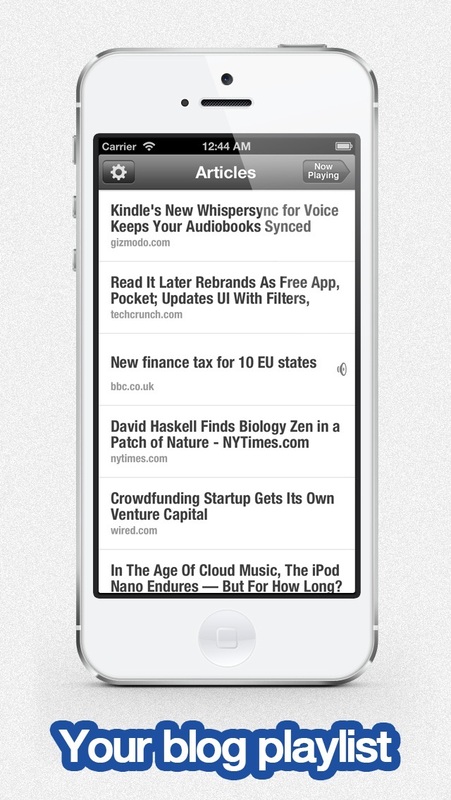 Pocket(formerly Read It Later) is a free service which allows you to save articles you encounter online. ◆How do I use Pocket? Create your account for free at http://getpocket.com. Then, install Pocket's browser extension or a bookmarklet on your browser, so you can save articles to your Pocket queue in one click. 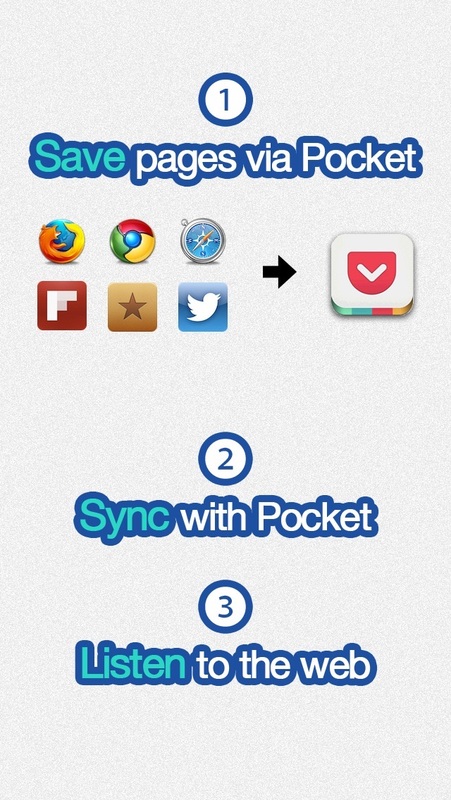 Pocket is also integrated in many kinds of apps for News, RSS, and Twitter including Flipboard, Reeder, Tweetbot. For example, if you're using Twitter, you can configure it so that links embedded in a post can be sent to Pocket in two clicks. 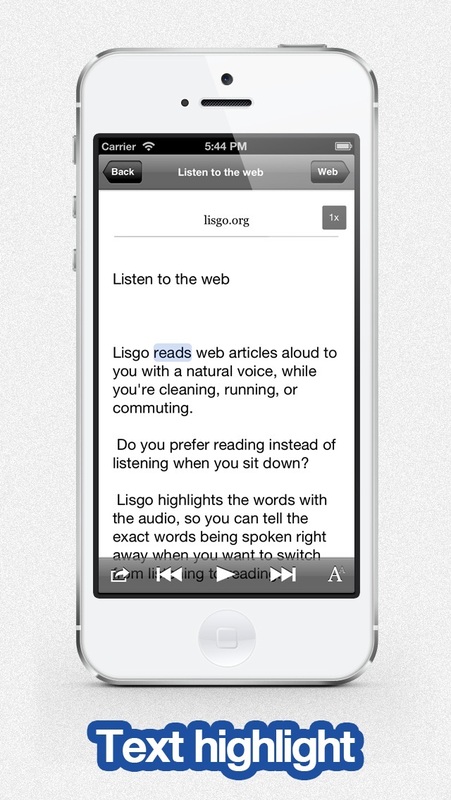 With Lisgo, you can fetch your Pocket reading list, and listen to them on the go. ◆Does Lisgo support RSS feeds, Instapaper, or other services? Lisgo only supports Pocket. By the way, if you use https://ifttt.com/, you can import newly updated RSS feeds into Pocket automatically. Love, Love, Love this app. I hope the developer will update this app for future iOS upgrades. I used to use Lisgo just fine on my ipad2 with minimal storage. Now I have an iPad Pro with lots of storage. I'm a senior citizen who listens at night when I cannot sleep well and the continual play feature is even better than the voice option in the Pocket App. With Pocket you have to start every new audio article yourself. With Lisgo, the articles load themselves for hours. Of,course, you need Pocket for Lisgo to tap into. Nonetheless, Lisgo is pure genius. Thank you Lisgo! It appears this app was last updated in 2013. Since a) Pocket sign-in is required and b) Pocket just shows the main screen when it is redirected, Lisgo cannot connect. Therefore, I cannot use the app. I'm sure it would be a great app if I could actually evaluate and use it. Unfortunately, two years without updates and an inability to use the app give me no qualms about giving a zero-star review. Just use iOS's text to speech for free. If you are going to charge for the app, then don't list as free. You get about 15 minutes a day to use for free. Which is not enough time to even bother with. It allows only 15 minutes of reading time a day, then stops working. It then prompts you to upgrade to the paid version for unlimited use. Here's my problem with that: 15 minutes of use not enough time to decide if the app is worth the paid upgrade. It was also not sufficient time to get through one lengthy article. How about maybe doubling to up to 30 minutes a day or even better, switching to a month free before being required to upgrade? As for the reading quality, it's very robotic and was one prime concern. I have been wanting something like this for a long time. It's a shame Apple doesn't give you a simple way to accomplish this without a third-party app. In either case this one works very very well. Doesn't work anymore with iOS 8, but I loved this app while it worked! Works easily, but I find the voice very unclear. I need to be very focused to understand all the reader is saying. Also, 1x speed is very (unnaturally) fast.